← Open That Bottle Night 16 (OTBN 2015) – what will you drink?? OTBN (Open That Bottle Night) 2015 – wine galore and kosher Beef Bourguignon, what a party it was! This past weekend was the 16th anniversary of OTBN (Open That Bottle Night), and what a party we had. I originally posted that we would get to the nine bottles of wine, well we did but not those nine! Benyo brought over a bottle of the famous 2003 Syrah and a friend brought over a bottle of his own concoction, and so the Ella Valley and Katrzin will have to wait for another week. Kiddish was made over my friend’s Quail Hill Cabernet Franc, which was super smooth and fruity. After that we had some awesome whole wheat Challah, that my wife makes, and then on to some very nice olive and bean soup. The soup never ceases to amaze me, I love how the kalamata olives dominate the flavor profile, while the beans add the heft and body to the dish, really fun. Wine wise, things started off with a bang! The 2006 RSR was my last bottle – but this wine has another two to three years left in the tank easily! WOW! What a great wine that is. The layers are rich, dense, almost fleshy with rich mineral and earth – truly extraordinary! The 07 Yatir Shiraz was nice, but it really showed its colors the next day. The Netofa Latour red, was insane, a lovely black and blue wine – so old world in style that it was shocking that it was made in Israel. At this point we brought out the Beef Bourguignon, which if you follow the official recipe is not very kosher at all 🙂 Now, to be fair, the original video of the recipe did not call for bacon at all, instead she browned the meat in olive oil, in the video above. Still, the book has the bacon and so it has become the “law”. Since, our Jewish law does not allow for either bacon or the butter (no milk and meat), I was stuck with modifying the recipe to my liking. Instead of bacon I used Meal-mart Beef Fry and instead of butter and flour to thicken, I used chicken fat and flour. In the end, it was definitely not the fat free or healthy diet food of the 20th century, but we did serve a lot of wine with it – so if the 60 minutes episode about the French Paradox has any truth, we will all be alive to write about it! Follow Julia’s recipe – but use the ingredients listed above! For the non meat eaters, we made the onions and the mushrooms without any animal fats, along with roasted potatoes, and roasted vegetables. For side dishes, we went with rice and a fresh green salad for all. At this point the wines went California very quickly, and with it a few complications. The Power to the People wine had no issues at all, it showed exactly like it did two years ago and before! I could not believe that the sweet apricot and peach from the Viognier was still front and center to start! Soon enough the blue and black fruit took center stage and what a joy that wine was! The bottle emptied quickly. The next was the 2010 Brobdingnagian Petite Sirah, and wow were we WRONG! We opened the wine and it was closed, a few hours later the wine was still closed. So by the time we served it that night the wine was nowhere. However, the next day the wine started to open and 36 hours after opening the wine was at peak!!! Are you KIDDING ME!!! To be fair, I had stated that the PS in the kosher wine world was not for long storing and that it should be drunk within 5 years. However, the Hajdu/Brobdingnagian PS from 2010 is clearly NOT a wine to be trifled with! I was concerned for nothing and shocked by how closed the wine really was! Sadly, none of my guests had the chance to taste the massive beast! This wine was beyond anything I had imagined when I opened it and what a joy it was to enjoy two days later. I was so happy that my custom of saving wine to taste the next day worked out so well for me in this case. Also, to be fair, Lowell Jacobson of psychospath and a poster on the Rogov forum before his passing, did warn us that some PS need 36 hours of air – and he was 100% RIGHT! Thanks Lowell! The next wine was the 2003 Four Gates Syrah, the classic first and best Syrah that four gates has ever made. The wine was as rich as ever and not showing any deterioration. The bottle was a shiner, a non publicly sold bottle, without a label. When it was opened it had a bit of effervescence, but that blew off quickly and the wine shone beautifully. Sadly, by the time I could get to the bottle, it was empty, so I could not retaste it the next day. 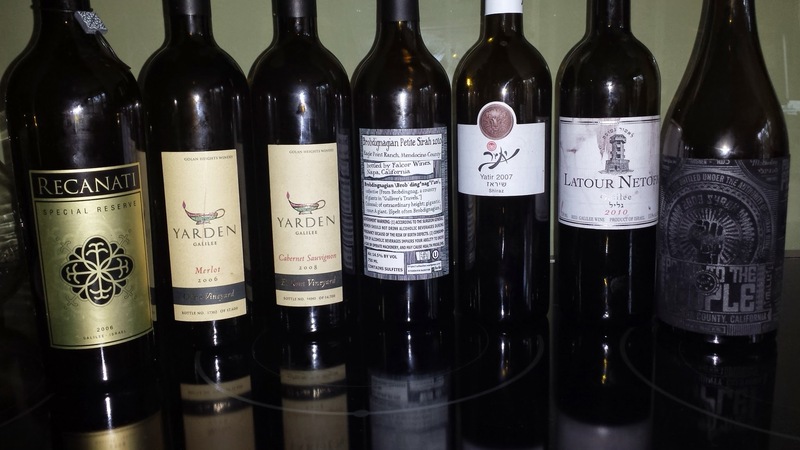 The last two bottles – were the 2008 and 2006 Single vineyard Yarden wines. As I stated in my OTBN article, these wines are the last of the great wines from Yarden, before they decided to go the way of over ripe fruit. Sadly, the 2006 Yarden Merlot, Odem is slowly moving in that direction. I would start drinking those up VERY FAST! The 2008 Yarden Cab, El Rom, is clean and beautiful and showing no dates of any sort. Still, the wine did not shine at that point like I had hoped. The wine did not shine much brighter the next day. I think the wine is asleep right now and that I will revisit it in 6 months. Well, there you have it – another lovely OTBN – an evening where I get a chance to open some of my better stuff and enjoy it with like minded individuals. Thanks to all my friends for putting up with the food and wine onslaught! Thanks to John and Dottie for the great idea, and hopefully next time we will bat 100%!!! The nose starts off with an intoxicating perfume of rich mineral, freshly shaved pencil, black cherry, mad tobacco, spice, and crushed herb. The mouth on this full bodied wine is rich and layered but elegant with now softening integrated tannin that coats and lingers, along with rich concentrated black fruit, that is not forceful but ever present, with sweet cedar, densely packed earth, spice, and herb. The finish is long with chocolate, tobacco, and great play between the tannin, fruit, leather, and herb, each giving way to each other o make for a very enjoyable experience. BRAVO!!! The wine is rich and layered and lovely in all the right ways. This wine took a LONG time to open. To start it was a blackcurrant bomb that was out of control. With time that passed and the wine opened to a barn full of hay and barnyard notes, rich with dark fruit, and tobacco. The mouth on this full bodied wine is rich and layered and deeply extracted with lovely black currants, dark cherry, blackberry, lovely oriental spices, tart currants, raspberry, and sweet cedar. The finish is long with lovely acid and spice, nutmeg, leather, coffee, and tar – lovely! The nose on this wine is super and very ripe, with jam like and perfumed boysenberry, spice, ripe black fruit, and nutmeg. The mouth is insane with concentrated jam fruit, wrapped in intense mouth coating tannin, backed by lovely elegance and fortitude, showing lovely blue and black fruit, with spice, loamy fresh dirt, nice acid, along with sweet oak. The finish is long and spicy with root beer, watermelon, black tea, and spice – LOVELY!! The wine is so old world in style while being new world in reality, that people were split on the table. Some loved it and some were not sure. The wine is great – said it then and a day later as well – BRAVO!!! Good news! The wine is showing very much like it did a few years ago. The wine is still ripe and vibrant with rich acid and sweet notes. This is the 2009 edition of the Weiss brother’s micro boutique winery production. Each year, since 2008, the Weiss brothers have produced wine that was generally available to the public. This is the inaugural release for their officially named winery – Shirah (now we can stop using the term Weiss brothers). It is a blend of McGinley Vineyard grapes and Thompson Vineyard grapes, both in Santa Barbara County and both cool weather vineyards. The wine is a blend of the two vineyard’s Syrah grapes and 2% Viognier grape. Having tasted both parts before tasting the blend – you can see how both parts make up this whole. The nose on this electric purple colored wine starts off with a unique attack of peach, apricot, and lovely violets and other floral hints. These stemming from the 2% Viognier, making one wonder how 2% of any fruit can impact a wine so. This wine is only four years old and still showing it well. As the wine opens more, the peach and apricot leave and the floral notes stand in their stead, both from the Viognier and from the Syrah. The wines from Shirah and the Weiss brothers never cease to amaze me with their sweet and ripe fruit that is also NOT overripe, hot, or overly new-world in style. The nose on this purple colored wine starts with the unique Viognier nose and then moves on to redolent notes of blueberry, black cherry, and blackberry. The mouth on this is rich, layered, and inky with pure and focused fruit, cedar backing, raspberry, sweet berries, and lovely spice that highlights the wine and comes together with mouth coating integrated tannins. The finish is long and spicy with animal notes, graphite, tobacco, and leather all coming together with blueberry, watermelon, and cinnamon lingering nicely. The nose on this purple colored wine is hopping with mad blackberry, freshly crushed blueberry, freshly made raspberry tea, and rich spices. The mouth of this full bodied wine is finally coming out after 24 hours! The wine was not ready to play at the tasting – when we opened it, but now 24 hours later it is really shining well. The mouth on this full bodied wine is rich and layered with black cherry, ripe plum, blueberry, boysenberry, and layers upon layers of intense searing tannin, concentrated and extracted! This is crazy wine with root beer commanding the mid palate, searing acid, lovely spices, and sweet cedar. The finish is long and bright with tart blueberry, searing tannin, chocolate, vanilla, watermelon, and lovely sweet spices – BRAVO!!! With even more air, 2 days later, the extraction now commands the palate and the sweet fruit, blue and black are balancing with still searing tannins and great sweet chocolate on the long finish – WOW!!! This was the first Syrah that Four Gates Winery has ever released, and maybe the best one so far. The wine is clearly in drink NOW mode, but still showing very well. The wine starts off as black as the night with lovely blackberry, black plum, blueberry, smoky notes, and graphite. The mouth on this full bodied and rich wine starts off with layers upon layers of concentrated black and blue fruit, blackcurrant, raspberry, good oak extraction, green bell pepper, lovely green notes, and lovely cedar that is now coming together into a lovely mouth coating and round wine. The finish is long and balanced with spoons of spice, cloves, black pepper, baker’s chocolate, and tobacco, on a bed of ripe black and blue fruit. The fruit is not as sweet as the Weiss and Brob wines, but rather the wine is more Rhone in style with mineral, oak extraction, leather, black pepper, and baker’s spices. This is the first single vineyard Merlot from the Odem Vineyard. This vineyard is tended to organically, but the word Organic is nowhere on the label as there are sulfites added. The last time we had this bottle the first thing that hit you was the massive amount of menthol and spice that there was. This time the menthol and herb was under control, and it was accompanied by candied plum, nice chocolate, blackberry, eucalyptus/menthol aromas, and black cherry. I must say that the wine is turning sweet and starting to show candied fruits. So, I would start drinking up if u dislike dates like I do. The mouth is richly extracted and needs an hour to open with massive and inky with mouth coating tannin, layer upon layer of spice and herb, black fruit that is focused and concentrated, sweet candied raspberry, and sweet cedar that is integrating and rich in the mouth. The finish is super long and spicy with lovely tobacco, chocolate, blackcurrant, orange rind and loamy dirt. Over time the wine opens further and shows layers of butterscotch and creamy vanilla. I was hoping for so much more from this – please do not think I did not like this – but I did not love it. I am sure it was a bad day for me or the wine, and I will keep trying them over the coming years, as I have more. 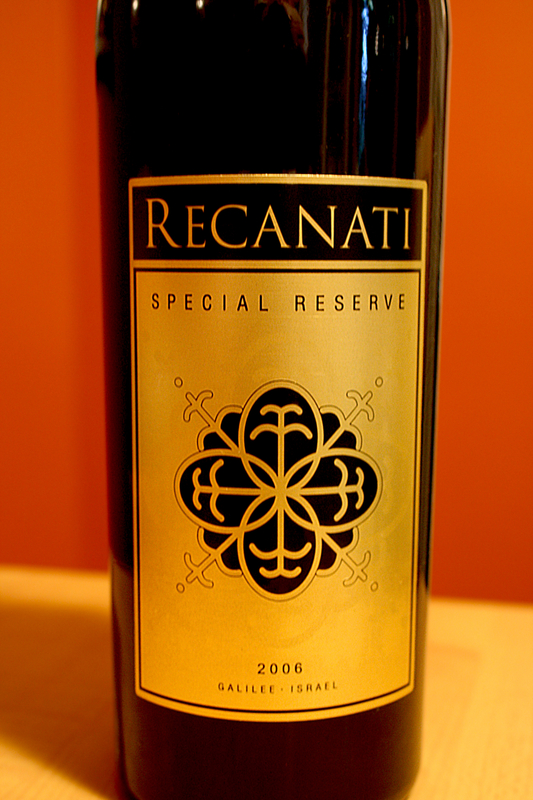 The nose is super ripe and rich with dark fruit, sweet cedar, oriental spices, and rich tobacco. The mouth on this full bodied wine is brooding and rich, and I think asleep right now, with massive layers of concentrated fruit, blackberry, black plum, ripe and controlled and not a date to be found, with sweet vanilla, dark rich chocolate, and mad toasted wood all around, backed by searing tannins and light extraction. The finish is long and sweet with more cafe mocha, rich chocolate goodness that lingers very long! Posted on March 2, 2015, in Food and drink, Israel, Israeli Wine, Kosher Red Wine, Wine Tasting and tagged Brobdingnagian, Cabernet Sauvignon, Domaine Netofa, El Rom, latour netofa, Merlot, Odem Vineyard, Petite Sirah, Power To The People, pttp, Recanati Winery, recipe, Shirah Winery, Shiraz, Special Reserve, Yarden Winery, Yatir Winery. Bookmark the permalink. 4 Comments.